Made in Mexico from the finest 100% blue Agave, El Conquistador Blanco is placed in oak barrels before bottling. Its clean crisp flavour make it an excellent choice for margaritas and other cocktails, or straight with or without salt and lime. Packaged in an elegant hand blown bottle. Made in Mexico. 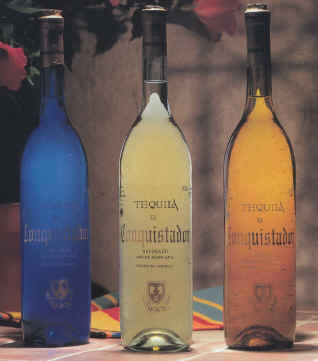 Rested in oak barrels for a minimum of 7 months before bottling, El Conquistador Reposado is one of the finest Tequila's Mexico has to offer. Made from 100% blue Agave, the clean crisp flavour is enhanced by an aroma that hints of vanilla. The finish is rich and smooth. Packaged in a beautiful hand blown bottle. Made in Mexico. With a leisurely stay in oak barrels for a minimum of 18 months before bottling, EL Conquistador Anejo is clearly at the top among the world's premium Tequilas. Made from 100% blue Agave, this Anejo features a rich, aromatic bouquet, spicy well balanced flavour, and a long, slightly sweet finish. Packaged in a one of a kind hand blown bottle. Made in Mexico.